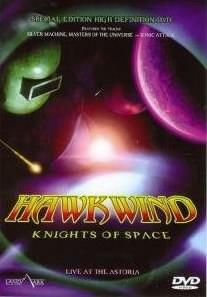 Hawkwind - "Knights of Space"
Let's just say that I was so disappointed with this release. Advertized as a double DVD with an 8 page book it comes with neither the booklet nor the second DVD. The sound mix is pretty poor considering how professional a release from a band of this stature should be. The guitar sounds like Dave is playing in the next room and often, especially at the beginning, they focus on Tim and his theremin or synth-guitar thing and you can't hear what he is playing at all. Doesn't that band bother to look at these things or listen to them before they are released? I guess not. Anyway, this is the full show from the bands Astoria, London December 2007 show. It is a great set list and the visual show is amazing. It is toted as a 12 camera high definition shoot and while the picture quality is good it is still a lot of hand held video cams for sure and not real high end cameras. Enough of the downside. You get to see the band play some pretty cool tracks and DIBs, who got the bass and vocal job after Alan Davey split town, does a good job. Nice to see them play stuff like Flying Doctor, Damnation Alley, Time we Left, Robot, Alien I am and Utopia. I could do without the quite lame new song called Space Love. If you are a die hard fan then you must have it, otherwise I would avoid this one.